Come and see the birth place of one of the most famous writers – C.S Lewis, creator of Narnia, who was born in Belfast. Ireland both north and south had a profound influence on his life and work. Discover with us how the landscapes, traditions and heritage of Northern Ireland help to shape some of the most all inspiring stories ever written. What was the story that unfolded at his boyhood home that so dramatically affected the rest of Lewis’s life? What are the images that find their way into Lewis’s Narnia? Where did those images come from? What does he say about them? And how does he use them in his writing? Join us and walk in the footsteps of Lewis. Participate in an unforgettable journey to discover the places, stories and inspirations for many of his greatest works. The C.S Lewis Experience is a series of coach tours designed specifically to cover the life and works of C.S Lewis and answer those intriguing questions about his life and writing. The live commentary throughout the tour highlights the locations and their significance in Lewis’s published work. Authentic Ulster can provide tours that are entirely suited to your group. The tour locations visited in Belfast will cover all those that are of particular significance to Lewis and his writing. For groups wishing to devote a bit more time, the additional locations in County Antrim and County Down will be included. A half-day tour (approximately 3 hours) that will take you on a stimulating journey around Belfast to the locations in which Lewis grew up. A coffee stop and lunch option can be included. This tour is scheduled across a morning and afternoon and will introduce you to the influences which shaped Lewis’s early life. A light lunch and/or an evening meal at the 400 year old Crawfordsburn Inn which has a historical link with C.S. Lewis is an option on this tour. After a pleasant meal, while remaining at the Inn, a short presentation can be provided on the significance of Crawfordsburn in the life of C.S. Lewis. A short walk after the visit will provide an opportunity to stop at Silverhill, the home of Lewis’s lifelong friend Arthur Greeves. Introduction to Lewis, his family and associated locations in central Belfast. The North Antrim Coast and the holiday letters of Lewis’s mother, Flora. County Down including Crawfordsburn, Bangor, Killyleagh and the Kingdom of Mourne. 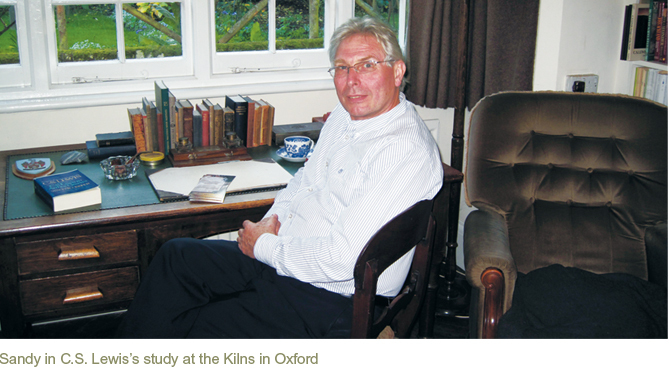 This itinerary can be expanded to include a 3 day visit to Oxford forming a very comprehensive C.S Lewis study tour. Authentic Ulster can work with and advise any group that has specific interests and assist with the design of an itinerary to suit needs, interests, time available and budget. Sandy Smith is a director with Heritage Experience. Prior to the company being established, Sandy enjoyed several other fascinating posts since graduating from Queen’s University, Belfast in 1973. After joining Goodyear International he took a lecturing post at the University of Ulster until 1988 when he moved to the Department for Education as an inspector of schools and colleges. In 2002 he became joint Director General with the International Fund for Ireland and in 2010 he joined the Board of Enterprise Northern Ireland which he chaired from 2011 until 2013. Across his career Sandy has sustained a passionate interest in the life and work of Belfast-born author C S Lewis. In 2005, in conjunction with Belfast City Council, he developed and led the highly successful lecture tour “In the Footsteps of Lewis”. 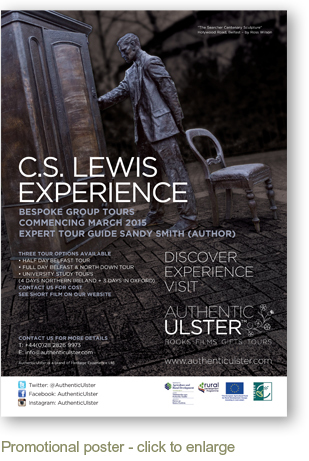 This has proved to be a successful tour and participants from all over the world have been enthralled as Sandy conducts the tour of locations in central and east Belfast that have a link to C S Lewis and his family. The tours have been extended to meet the needs and interests of University groups mainly from the US to include the North Antrim coast and also County Down for which Lewis had a particular affection. 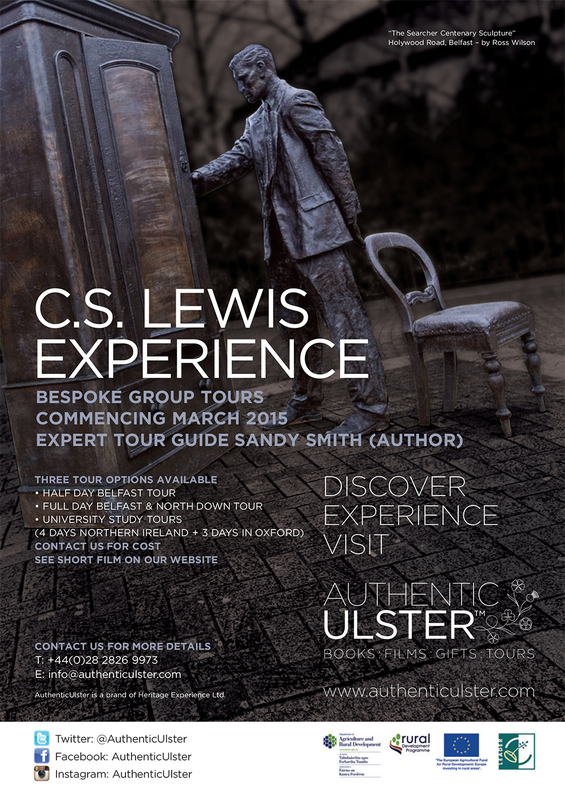 Get in touch with Sandy at sandy.smith@authenticulster.com to begin your C.S Lewis Experience.